Kansas GOP Insider (wannabe): Truly conservative? In one corner: Sen. Pat Roberts, and his full-steamed freight train carrying pretty much every Republican officer holder and a war chest of more than $1.5 million. In the other corner: Milton Wolf, and probably 75 cents or so. Yesterday, Roberts supporters were touting Roberts' lengthy list of endorsements and something saying he was the "5th Most Conservative Senator." 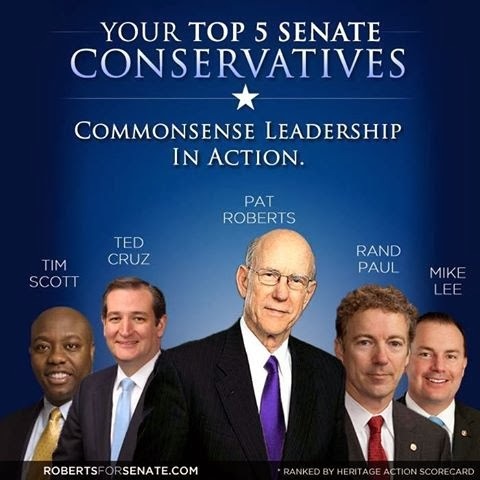 I guess it all depends on your criteria, but this meme that lists Pat Roberts along with Mike Lee, Ted Cruz, Rand Paul and Tim Scott as the most conservative members of the Senate is laughable. I found myself wondering if it was Photoshopped. And then I found myself wondering, am I crazy for not buying it? Answer: Nope. I'm completely normal and everyone else is completely blinded by, I don't know what. Loyalty? Just because Kansas political activists say it a million times, that doesn't mean I'll buy it. • He has an 89 percent from Heritage Action. • AND is in 36th PLACE behind John McCain and Lindsey Graham, according to the Club for Growth. I rest my case. I am completely sane, and there are a few people potentially headed for padded rooms because of this race. Perhaps most persuasive in the National Review article is this: When Ted Cruz beat the Texas Establishment favorite, Lt. Gov. David Dewhurst, few doubted that Dewhurst would vote as a conservative on most issues. "But since Cruz took office, he has proven his point: It is inconceivable that Dewhurst would have spent his August recess pushing to tie the defunding of Obamacare to the continuing resolution..."
I should add, because heaven knows, this Wolf vs. Roberts race is headed for blood-shed, I'm not advocating for Wolf. I'm dispassionate about this race, because in the grand scheme, a conservative is going to represent Kansas in the U.S. Senate. Just how "conservative" is in the eye of the beholder. Does Roberts vote correctly most of the time? Sure. Will he lead the charge even at times when leading the charge isn't politically expedient? I'm not so sure. And if you asked me those questions about Wolf, you'd get the exact same answers.